The flag of Togo is the national flag, ensign, and naval jack of Togo. It has five equal horizontal bands of green (top and bottom) alternating with yellow. There is a white five-pointed star on a red square in the upper hoist-side corner. It uses the popular pan-African colors of Ethiopia, but the design resembles the flag of Liberia which itself echoes the flag of the United States. The flag was officially adopted on April 27, 1960. It features a white “Star of Hope” on a field of red. The four colors (green, red, white and yellow) are the Pan-African colors. The flag was designed by artist Paul Ahyi and approximates a golden rectangle closely. Ahyi (January 15, 1930 – January 4, 2010) was regarded as among the greatest of African artists of his generation. Born in Togo, Ahyi graduated from the École nationale supérieure des Beaux-Arts in Paris in 1959 and returned to Togo. He designed the flag of Togo while working on other contemporary works. The flag was adopted on April 28, 1960 and is still in use. During France’s rule over Togo from 1957 to 1958, the flag of French Togo was used. 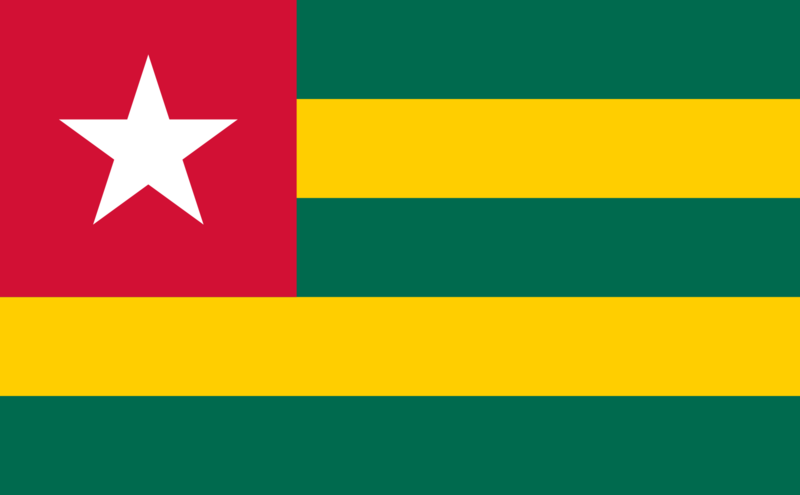 After Togo’s independence, the first Flag of Togo was used from 1958 to 1960.